Mobile computing is not a single technology, but a comination of three components (handheld computing device, connecting technology, and a centralized information system), each with different platform considerations, costs and risks. Successful implementation of mobile computing requires employing all of these components in the way that best suits the work and environment of the end users. Mobile computing devices such as handheld terminals, wearable terminals, vehicle mount terminals and tablet computers help skilled workers use their time more efficiently. "The greatest challenge for many organizations is to develop and maintain consistent and efficient internal processes." For businesses with mobile workers, the most effective and profitable way to do this is through the use of mobile computing. Mobile computing increases accuracy and efficiency by eliminating redundant data collection and data entry steps. With the automation that mobile computing solutions can provide, your organization’s skilled employees can use their time more effectively, rather than spending hours on tedious tasks such as data-entry and office operations. No matter what your company’s challenges are, there is a mobile computing solution that will collect, process, and share the information you need. Scanning bar codes, documenting service, integrating voice communications and GPS are at your fingertips with Advanced Mobile Group’s handheld terminal offerings. Enjoy on-the-go productivity with our handheld mobile computers and support services. We offer handheld terminals from leading brands such as Zebra and Honeywell. Advanced Mobile Group’s wearable terminals offerings enable your warehouse workers to improve productivity and accuracy by providing the most advanced technology in a wearable solution. Streamline your operational efficiency with our convenient and high performance terminals. Vehicle mount terminals are an integral part of any warehouse, distribution, storage or industrial business that operates fork lift trucks and warehouse vehicles. After understanding your unique business and technical requirements, Advanced Mobile Group will provide the most effective vehicle mount terminals for your operation. Advanced Mobile Group offers rugged tablet computers that are ideal for your field workers who compute and enter data while moving around your warehouse or storage facility. 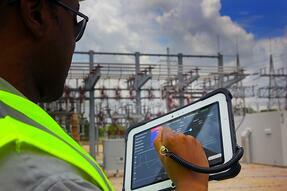 Tablet PCs provide on-site, real-time productivity in the harshest environments. Contact us to learn more about our mobile computing solutions.